Tell Me I’m Pretty is not Cage The Elephant begging for attention. In fact, with this album, Cage knows they are pretty, and are daring you to disagree. The opening track Cry Baby opens like a Beach Boys record with a slight distortion. Like a stormy day on a beautiful southern California beach, it’s inviting, but an element of danger seems to be looming in the air. And as lead singer, Matt Schultz, bellows “I think it’s pretty strange watching the passers by”, the scene is set. 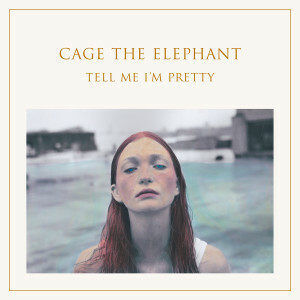 As the opening track opens up, it’s clear that Cage the Elephant’s evolution from their catchy, star turning Ain’t No Rest for the Wicked has reached new, sonically diverse levels. From Cry Baby, Pretty launches into the first single off the album, Mess Around, and one of the few tracks that feels suited for radio play. But don’t let the lack of commercial friendly rock tunes deter you. Pretty is a complete album, not one built around a few, isolated tracks disguising its limitations. This is an album that will continually challenge you to rethink which tunes are you favorite. If you’re in an introspective mood, you may find yourself drawn to Trouble or the haunting Too Late to Say Goodbye. If you’re in need of a toe tapper, Pretty gives you That’s Right and Punchin’ Bag to feed your craving. If you’re expecting an album to crank up to an eleven and throw your head into a nodded rage, this isn’t it. Pretty is an album of purpose and feeling. It has a rock aesthetic, with deep, dark chords but it requires the listeners’ attention. Cage seems to be on a similar trajectory as Nirvana prior to Cobain’s unfortunate passing. Since their self-titled album, a hard rocking, rough and raw affair, Cage has taken a rare course in today’s music scene, a path of growth and experimentation in sound that challenges their fans to grow with them as they mature. This is an album equally suited for the turntable as it is for the car stereo, blending the atmospheric sound of the 60s, with the punk flare of the early 80s, and the lyrical ache of 90s grunge into a perfectly crafted collection of songs embedding Cage The Elephant as a band to be reckoned with.